Environmental Defense Fund’s new flagship blog collects stories, ideas and arguments from all of our EDF expert voices in one place. EDF’s Energy Exchange blog is where we discuss how to accelerate the transition to a clean, low-carbon energy economy. We keep you updated on the latest clean energy news and provide thoughtful analysis on the issues. However, we know you may have a broad interest in environmental issues. That’s why we wanted to share with you Environmental Defense Fund’s new flagship blog, EDF Voices. 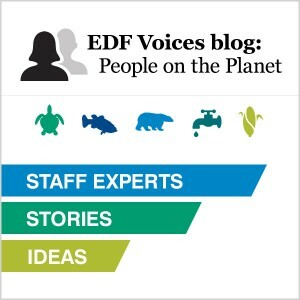 EDF Voices collects stories, ideas and arguments from all of our EDF expert voices in one place. Our thought leaders use this space to weigh in on all sorts of environmental issues, from tips on how to convince people of the reality of climate change to reflections on how a businessman turned conservationist decided to leave a natural legacy for future generations. We hope you like what you read on our new EDF Voices blog and become a subscriber.